We’re so close to Memorial Day weekend, we can taste it in the air. Spend this week counting down the days to summer by filling your social calendar with outdoor activities from yoga to a rose cruise around Manhattan. Here’s our picks for your week ahead. New York City’s largest hotel pool opens to the public today, which means your post-work or midday hangouts are about to be a lot cooler. The glamorous Beach at Dream Downtown Pool area boasts a 4,800-square-foot beach, a 700-square-foot bar, and a glass bottom swimming pool looking into the hotel lobby. This chic spot will also have luxury pool floats and a giant 10 pound Moscow Mule, creating a picture-perfect Instagram setting. Get your day pass for just $65, or go in on a chic cabana with your friends for $1,500. Get more information here. The Beach at Dream Downtown, 355 W. 16th St., New York. Monday-Friday, starting at 11 a.m. Mix up your boring workout routine with an outdoor yoga class with TMPL Gym, David Barton’s luxurious Midtown West gym. Head on over to the Worldwide Plaza during your lunch break and soak up the sun while taking part in the gym’s most popular yoga class. Get more information here. TMPL Gym, 355 W. 49th St., New York. 12:30 p.m.
Start making your weekend plans tonight by grabbing a ticket to The Village Voice’s Choice Eats event on Friday. Featuring more than 50 handpicked restaurants from all five boroughs, this foodie event is back for its 10th year. Sample the best dishes from restaurants reviewed by The Village Voice, as well as desserts, and complimentary alcoholic beverages. We attended last year’s soireee and had a blast, so don’t miss out! Get tickets here. Metropolitan Pavilion, 125 West 18th St., New York. 7-10 p.m.
Called “one of the best wine festivals across America” by Food & Wine Magazine, La Nuit en Rosé New York is back for its fourth year. From May 18th to May 20th, attendees can board the Hornblower Infinity Yacht and soak in breathtaking city views, all while indulging in more than 100 varieties of rosé wines. This is the perfect way to say hello to rosé-drinking season! Get your tickets here. Hornblower Infinity Yacht at Pier 40, 353 West Street, New York. In the middle of planning a wedding? Then head to Hotel 48LEX‘s beautiful bridal lounge, created in collaboration with Nicolette Weddings, for an evening of cocktails, spectacular fare from Lexington Brass and elegant wedding activations. Whether you’re looking for a place to host your engagement party or a post-wedding brunch, Hotel 48LEX is a great option for all your wedding-related needs, and tonight’s event will give you an opportunity to check out the space and all it has to offer for yourself. This event is open to the public, but an RSVP is required, so make sure to send an email to hotel48lex@nicoletteweddings.com. Hotel 48LEX, 517 Lexington Ave., New York, NY. 6-9 p.m.
Shopaholics and foodies won’t want to miss Pop Up Nation’s latest seasonal immersion experience, Spring Daze. Explore a curated selection of bright and energetic brands of spring apparel, accessories, desserts, and more this weekend. Some participating brands include Wowfulls, Smoothie Beauty, Her Velvet Case, and Pressed Juicery. Get more information here. 435 Broome St., New York. 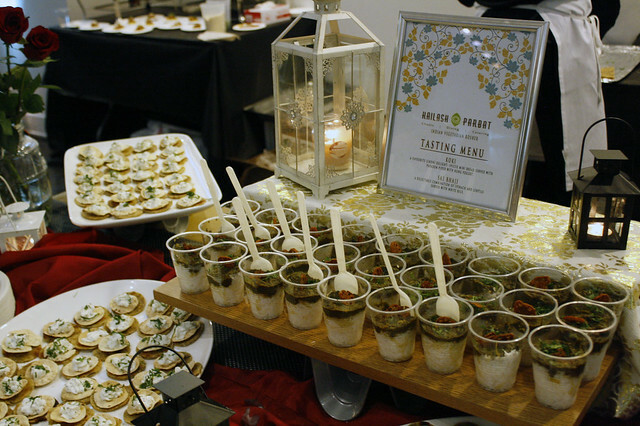 Friday-Sunday, 11 a.m. to 6 p.m.
Join April Bloomfield, Ken Friedman, and other award-winning chefs tonight at the 10th annual Taste of the Upper West Side to celebrate the neighborhood’s most mouth-watering eats. More than 40 local restaurants will offer up delicious dishes for you to sample, and the event will also feature fine wine and spirits, as well as a DJ. Some participating restaurants include Boulud Sud, Rosa Mexicano, and Jacques Torres Chocolate. Get tickets here. Grand Tent, O’Shea School Yard, W. 77th & Columbus Ave., New York. 7:30-10:30 p.m. This Sunday, don’t miss the Sunday Undies Brunch at The Green Room 42 in the YOTEL. I checked it out recently and absolutely loved the entertainers, a two-man band called The Skivvies. Not to mention the bottomless brunch was on point. Read my review here, and get tickets to this one-time performance here.